History: It is quite clear that meteorite collectors in Northwest Africa have discovered a large L chondrite strewn field at an undisclosed location. At least 2 metric tons of material comprising thousands of individuals has been sold under the name NWA 869 in the market places of Morocco and around the world. Individual masses are known to range from 20 kg. It is certain that NWA 869 is paired with other NWA meteorites, although no systematic survey has been done. It is also possible that some stones sold as NWA 869 are not part of the same fall, although dealers are confident that most of the known masses are sufficiently distinctive from other NWA meteorites in terms of surface and internal appearance that the error rate should be fairly low. Scientists are advised to confirm the classification of any specimens they obtain before publishing results under this name. Petrography and Geochemistry: (A. Rubin, UCLA) A fragmental breccia of type 4–6 material; one thin section dominated by an L5 lithology gave olivine (Fa24.2). Classification: Ordinary chondrite (L4–6); W 1, S3. Specimens: A 189.3 g type specimen is on deposit at UCLA. Revised classification and description. Submitted by K. Metzler, IfP, with data from Metzler et al. (2011) and Welten et al. (2011). 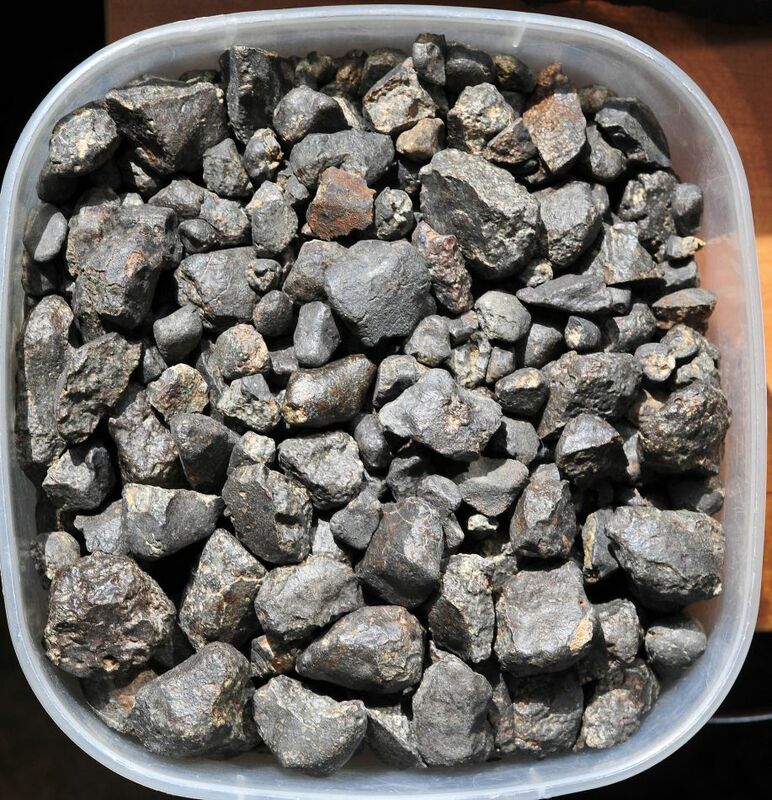 Physical characteristics: Most samples are individual meteorites but some fragments (mostly >1 kg) also occur. In most cases the fusion crust has been polished or ablated by wind erosion. Many samples are more severely affected and show faces with deep wind erosion features. Fracture faces, formed by ground collision, show a typical gray-green color and sometimes visible brecciation (light and/or dark clasts). Due to the coarseness of this breccia, there are some stones that consist of only a single lithology. Petrography: This chondritic breccia consists of about 75 vol% matrix with unequilibrated and equilibrated L-chondrite clasts (up to 5.5 cm), some of which display shock-darkening. Impact melt-rock clasts, themselves either clast-free or clast-poor, also occur and are strongly depleted in Fe,Ni metal and sulfide. Geochemistry: Northwest Africa 869 is a regolith breccia, containing solar noble gases and preirradiated lithologies. Olivine in lithic clasts: Fa0.2-49.2; olivine in matrix: Fa10.3-29.3; low-Ca pyroxene in lithic clasts: Fs2.1-35.9; low-Ca pyroxene in matrix: Fs7.0-23.9. Bulk oxygen isotopes: δ17O = 3.52; δ18O = 4.67; Δ17O = 1.09 per mil. Terrestrial age: 4.4 ± 0.7 ka. Preatmospheric meteoroid size and mass: 225 ± 25 cm, 120-230 T.
Classification: Because NWA 869 contains unequilibrated clasts, its classification is revised to L3-6.